1 of 4 Grate zest from 1 orange into a small bowl. Cut peel from both oranges and slice flesh into segments; set aside. Squeeze juice from membranes into bowl with zest. Whisk in 1/2 tablespoon olive oil, soy sauce, honey and 1/4 teaspoon each salt and pepper. 2 of 4 Heat a large nonstick skillet over medium-high heat. Toast walnuts for 5 minutes or until fragrant; remove from heat. 3 of 4 Heat remaining 1/2 tablespoon olive oil in skillet over medium-high heat. Season scallops with remaining 1/4 teaspoon each salt and pepper. Saute 3 to 4 minutes per side. Remove from skillet; keep warm. 4 of 4 Toss orange segments, walnuts, red onion and spinach with dressing. 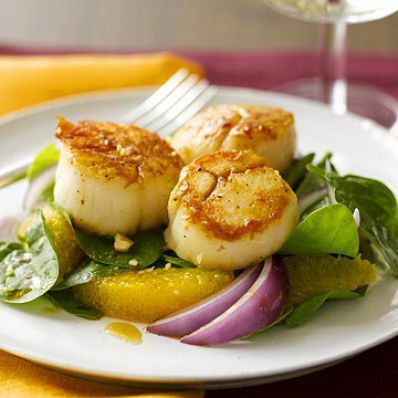 Place 1-1/2 cups salad on each plate and top with scallops.